Robot Mode: Much like with his fellow Terrorcons, the first thing I thought upon seeing Sinnertwin’s robot mode was that he’d make a great Genericon. There is just something so Late-80s-Marvel-TF-Comics about him, I love it. He’s blocky, he’s colorful, and he’s got a cute little look of befuddlement on his face, too. Very nicely done. He’s an extensive retool of Power of the Primes Snarl, but you barely notice. He looks all new! Sinnertwin comes with a green rifle and the obligatory combiner fist he can wear as a chest armor. It doesn’t look as bad on him as it does on other figures of the line (*cough* Moonracer), but still not all that good. Side note: for the very first time I noticed that this little filler plate in the combiner fist, where you can also fit a Prime Master, is actually meant to be a small hand gun. Not that it really looks like one, mind you, but you can use it as such. What else to write? Sinnertwin has the standard amount of articulation and detailing for a current-day Deluxe-class figure, so no surprises here. The two monster heads from his alternate mode are on his back and if you want you can flip in his robot head and instead turn him into a robot with two monster heads, too. Overall I very much like this robot mode. It’s nothing spectacular, but very nicely done. Thumbs up! Alternate Mode: Sinnertwin transforms into a two-headed yellow hell hound creature of sorts. The robot basically goes down in all fours, the two beast heads flip forward from the back, and that’s pretty much it. But it makes for a pretty cool-looking monster, no doubt. The two monster heads are ball-jointed with opening jaws. Sadly the necks can only move up and down, not sideways, but that’s just a small thing. Not much more I can write here that the pictures don’t tell better. You can store Sinnertwin’s rifle on the beast’s back and the big combiner fist / chest armor attaches to his side. He’s got those little knobs on his back where you can plug in the feet of Titan- or Prime-Master figures. And he looks pretty good as a two-headed Hell Hound, too. Nice beast mode. 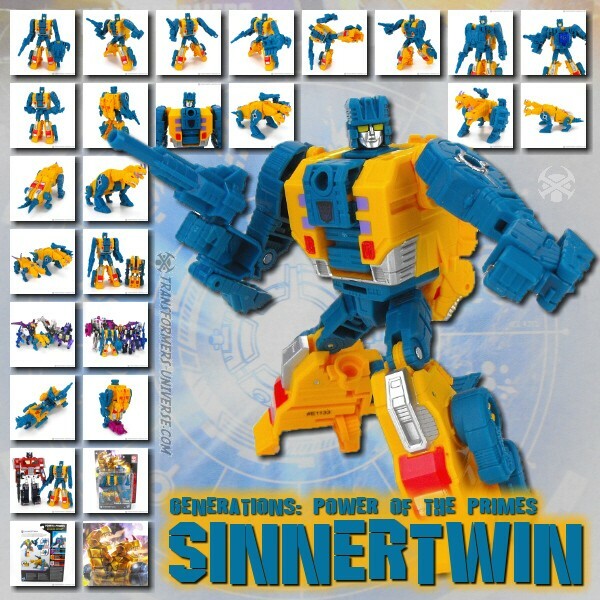 Combiner Mode: Sinnertwin becomes an arm or a leg of the Abominus combiner and is compatible with pretty much every torso-robot from Combiner Wars and Power of the Primes, too. More on Abominus once I’ve finished reviewing the individual team members. Remarks: Sinnertwin, mostly known as “the other Terrorcon who also got two heads”, shares the fate of his fellow team mates in that he never got much in the way of character development or media presence apart from being part of the team and Abominus. He’s got one of the cooler names in TF history, but that’s about it. As a figure Sinnertwin is good. He’s not my favorite Terrorcon, he’s more that guy you need to buy in order to complete the team and the combiner, but that doesn’t make him a bad figure by any stretch of the imagination. He just doesn’t stand out as much as Blot or Rippersnapper, for example. So overall a good Deluxe-class figure and a must if you wish to complete Abominus. And not bad as a stand-alone figure to fill up your Decepticon ranks, either.